Gwen has wanted a stand mixer for a long time. She’s worked in commercial kitchens before, and harbors the frank desire for a gigantic Hobart. That’s not in the cards. We’ve both been researching stand mixers for a while. Barring a Hobart, Gwen was interested in a traditional Kitchen Aid with an elevator bowl, which basically looks and runs like a tiny Hobart. I had come across the Bosch Concept 7, which is about as unlike a Kitchen Aid as a stand mixer can be. Costco had a special on some 475-watt Kitchen Aids, so we got one of those. We also got a Bosch mail-order. Today, Gwen made a couple of recipes on each, so we could decide which one to keep. The Kitchen Aid has the traditional design, somewhat like a crane, with the drive on top and a bowl-lifter on the vertical column. It has an old-fashioned Machine Age look to it, and the exterior made entirely of metal, except for a couple of knobs. The Bosch is a smooth, low-profile wedge with a vaguely iPod aesthetic (or perhaps the iPod has a Bosch aesthetic). It’s entirely plastic except the drive gears. Power is transmitted through a central shaft that runs up through the middle of the mixing bowl. Part of the appeal of the Bosch is that it is compact enough that it can be stowed pretty easily—and it weighs less than half as much as the Kitchen Aid, so it’s easier to move around, although it feels solidly built, it has suction-cup feet, and of course, all the weight is at the bottom. Another big part of the Bosch’s appeal is that food-processor and blender attachments are available for it. Our kitchen is short on space, so being able to get rid of a blender base and a food processor (which is disproportionately bulky) is an important consideration. The flipside to this is the all-eggs-in-one-basket problem: if that base ever fails, we’re out three appliances. The Kitchen Aid comes with three mixing attachments—a dough hook, a whisk, and a cookie-dough paddle; The Bosch comes with a hook and whisks, and we bought paddles separately. 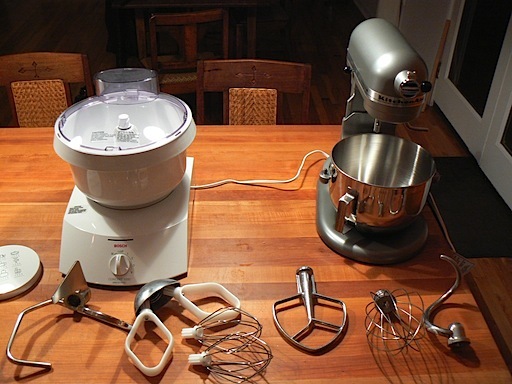 The Kitchen Aid drives all three through an epicyclic motion; on the Bosch, the whisk and paddles have two axes of rotation, but the dough hook has only one—it just goes in circles. It turns out that having two degrees of rotation makes the mixing process much more efficient: using the dough hook on the Bosch does work, but to some extent it relies on friction between the dough and the bowl. Although the Kitchen Aid has a lower-power motor, it was more efficient mixing bread dough. Also, given Gwen’s commercial-kitchen background, operating the Kitchen Aid was basically the same as operating a Hobart—as she says “when the dough starts climbing the hook, I know it’s done.” The layout on the Bosch is so different that it just doesn’t work the same way, and she would need to learn new cues. For different reasons, we observed that the Bosch was also less efficient making cookie dough. In this case, it came up a little short because the paddles don’t graze the bowl’s surface as closely as the paddle on the Kitchen Aid does, so ingredients that are trapped in that dead zone take longer to mix in. Also, because the Bosch’s bowl is half a torus, scraping down the sides with a spatula takes more work, and leaves a blind spot behind the drive column. We made about six pounds of bread dough in each of the mixers, and in the end, both did a fine job kneading, and making cookie dough. We suspect that the Bosch would really shine on bigger batches. The Bosch comes with a lid, which has a chute for adding ingredients. Getting ingredients down that chute was awkward—the opening is just too small to tip in a cup of flour (for example), and removing the lid definitely slows things down a bit. It’s possible to operate it without the cover in place, although a bit messier. Even without it, it’s less messy than the Kitchen Aid. Cleaning the Bosch’s bowl after kneading dough was far and away easier than the Kitchen Aid’s. The Bosch’s bowl is some kind of slick plastic, and the all dough just pulled away from it in one piece. Cleanup after the cookie dough was harder on the Bosch, because that stuff was more liquid and gluey, and tended to get caught in the gear that is built into the top of the bowl. As to the mixers themselves, the Bosch’s lack of surface features makes it much easier to clean. So which one are we going to keep? We haven’t decided yet. The Kitchen Aid is a known quantity for Gwen (who will do the vast majority of cooking with whatever we keep). The Bosch isn’t, and she wants to make another recipe before we decide. To reach a decision on which mixer to keep, Gwen made two cakes. Using the whisks on both mixers, the Bosch actually did a better job mixing—its batter was visibly smoother than the Kitchen Aid’s, and it got mixed with less spatula intervention. But the bowl is the Bosch’s Achilles’ heel: it is very large (to accommodate the driveshaft running through the middle), and it has no handle or spout—in fact, the lip of the bowl is distinctly ill-designed for pouring, with a notch for the lid to fit into, and a wide edge above that folding back into a sort of “cuff.” This made getting the batter out of the bowl such a mess that Gwen decided it wasn’t worth it. If she’s going to be discouraged from using it, it’s not worth it. Victory goes to the Kitchen Aid.